Toss the strawberries and ⅓ cup sugar together in a 8-inch glass baking pan and bake for 40 minutes. Remove from oven and let cool to room temperature. While the strawberries are roasting, place the jalapeno in 1¼ cups of the coconut milk beverage and place in the refrigerator for 1 to 2 hours. 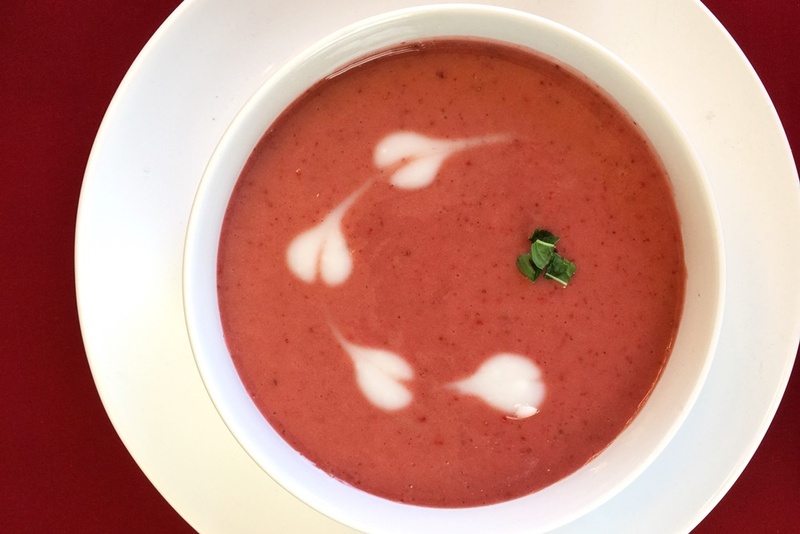 Add the roasted strawberries (along all the accumulated syrup), coconut milk beverage (discard the jalapeno), 2 basil leaves, lemon juice, triple sec, and salt to a blender and process until smooth. Pour the dessert soup into serving bowls and garnish with the remaining 1 tablespoon of coconut milk beverage and the chopped fresh basil.